I’ve had the same conversation many times over, where contact centre managers complain that outbound dialers burn their leads. Firstly we perhaps should stop and provide a definition of what it means to burn a lead as it is a term that is thrown around a lot and used in a very loose manner. A burnt lead, is one where you can no longer call the customer without receiving abuse or being reported for abuse. This is at the very hard end of the term ‘burn’ and you should never get even close to that point with a customer if you are using what I call ‘ethical dialing’ practices, but we will come back to that. 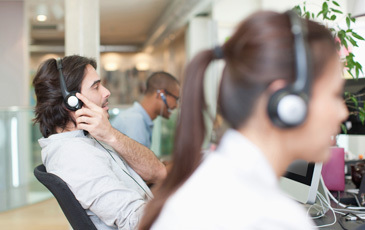 Many call centre managers confuse the term ‘burn’ with ‘used’. This is particularly true with call center manages who are new to using a dialer. A classic case of this confusing often occurs when a call centre first installs an outbound dialer. Pre-dialer the call centre might have been dialing 100 numbers per agent per day. With a 10 man team that equates to 5,000 leads a week. When the call centre starts using an outbound dialer the team might be able to dial 15,000 leads in a week or even more if the quality of the leads is poor (e.g. lots of disconnected numbers). If the call centre manager only loads 5,000 leads at the start of the week, they will likely run out of leads on Tuesday afternoon. The reality is that (correcting for other factors such as time of day) the team will have made the same number of connected calls by Tuesday afternoon as they would normally make in a full week. In this case the leads haven’t been ‘burned’ but simply ‘used’ at a much faster rate. As a simple rule of thumb, when implementing an outbound dialer you will need three times the number of leads compared to manual dialing. This number is somewhat variable based on the quality of those leads (e.g. number of disconnected numbers). So how does an outbound dialer get you to the point where a lead is burned? Essentially this can happen when you have your dialer misconfigured. Most outbound dialers offer a number of operation modes such as ‘preview dial, ‘power dial’ and predictive dial’. You select the dialer mode based on your team’s size and the type of call that is being made. (We will talk about how to select the right dialer mode in a later blog.) Each dial mode will have a different set of configuration options and these must be set correctly to ensure that you are ‘dialing ethically’ and not burning leads. The term ‘dialing ethically’ or ‘ethical dialing’ may seem a bit like a left wing, pot smoking, hippie dancing through the fairy circles kind of idea. In reality ‘ethical dialing’ is about good business and ensuring that you are not burning your leads. There are a few key factors in ethical dialing and ensuring you maintain your business reputation and your relationship with your actual and potential customers. Not to mention the fact that it will stop you falling foul of the regulators whom take a very dim view of ‘non-ethical dialing’. I’m not going to try and cover off all of the legal requirements of dialing but key ones that ensure your reputation and reduce the chances of burning leads. Abandoned calls occur when the dialer gets ahead of the agents and rings customers when no agents are available. This results in a customer answering the call and finding no one is at the other end, so they hangup. Customers find these type of calls extremely irritating. Dialer settings either directly or indirectly control the no. of abandoned calls. In some dialer modes (e.g. predicative) you will be able to directly affect the acceptable abandoned call rate. In other dialer modes (the dumb ones like power dialers) you can only indirectly influence the abandonment rate. The dialer modes which don’t let you directly control the abandonment rate are the dangerous ones. Industry standards suggest that you should aim for an abandonment rate of no higher than 6%. Higher Abandonment rates will result in a shorter time between connections to live callers. The down side is that it increases the chances that you will be talking to an already irate customer because they have received three abandoned calls today from you or some other inconsiderate call centre. A good outbound dialer will also let you set the maximum number of times the dialer will call the same customer when there is a risk that the call could be abandoned. I would recommend that you normally set this to no more than 2 abandoned calls. After the customer receives two abandoned calls the dialer should only ring the customer in a one-to-one mode. i.e. I have an agent waiting so I will ring this one customer. Essentially the dialer fails back to a preview mode. This ensure that you are able to use every lead whilst ensuring that you don’t burn the lead. Missed calls generate a very similar response to abandoned calls and a good outbound dialer will allow you to managed the number of missed calls a customer will receive before falling back to preview dial mode. If you are calling businesses you could consider blocking your caller ID (this is illegal when calling residential customers in Australia). There are pros and cons to blocking your caller ID (CLID) however one of the advantages is that if you receive a missed call with a blocked caller ID you will simply ignore the call. If you see a missed call with a caller ID or worse still multiple missed calls all with the same caller ID, through a strange twist of psychology you will actually feel more abused than if the caller ID is blocked. My guess is this is something to do with the fact that if the caller ID is visible, I feel like, maybe should do something about calling back, where if the caller ID is blocked, I know I can’t do anything about it so I can safely ignore it. In short there is no reason for an outbound dialer to burn leads and if you want to have a long running business then you need to ensure that you aren’t.